For over four decades, Garry Bentham has been turning visions and dreams into reality for the residents of Parksville, Qualicum Beach, Nanaimo and, in fact, most of Vancouver Island. 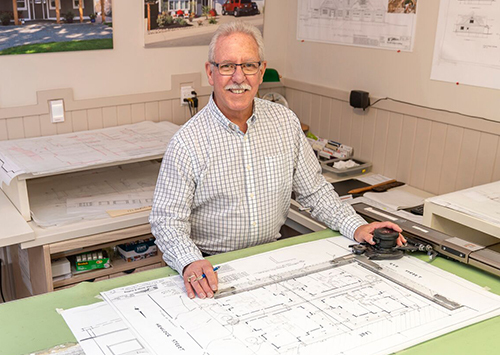 Whether you want to build a new home, renovate an existing one or spice up your landscaping, Garry has a design for you. He specializes in designing custom new homes and renovations as well as improving floor plans for a positive living environment. Are you considering a land purchase? Garry can design potential land use plans prior to your purchase. He can even show you how to get the best use out of your agricultural land. Looking at waterfront properties? Garry is experienced in low bank waterfront/sea level rise design, in collaboration with engineers and biologists. Designing and drafting plans to meet your specific needs is always at the forefront of any project with Village design & drafting. Serving areas from south of Nanaimo through Lantzville, Parksville, Qualicum Beach, Courtenay, Comox, Port Alberni and beyond.